SeniorsAloud: HANDS OFF MY EPF SAVINGS! Honestly, some of the things the government does makes no sense. Take the latest example. The government launched the My First Home Scheme in March 2011 to help young working adults own their first home. 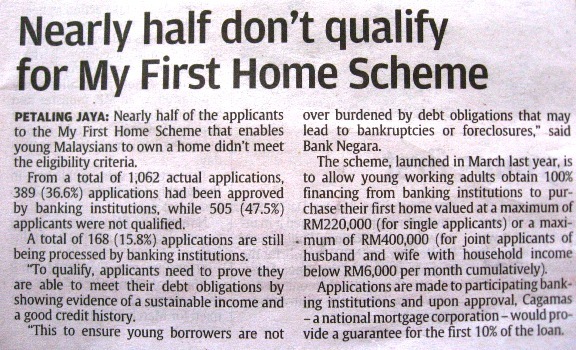 Banks were supposed to provide 100% loans for houses costing up to RM200,000 (for single applicants earning up to RM3k a month), and up to RM400,000 (for couples with a joint income of up to RM6k a month). Not surprising. Which bank would want to lend to borrowers who have a high risk of defaulting on their repayments? Time to crack the whip? Hah! Yet another empty threat. Meanwhile, over in Petaling Jaya, the PJ City Council (PJCC) is threatening to evict defaulters of their public housing scheme. Tenants of the low-cost apartments in Taman Putra Damai, Subang and in PPR Kota Damansara owe a total of RM10 million in arrears. 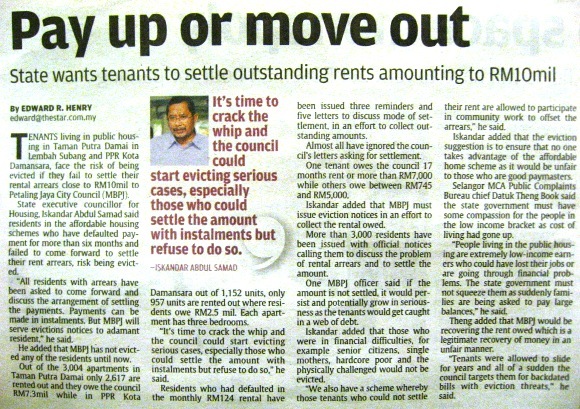 Despite the low monthly rental of RM124 for a 3-room unit, many tenants still don't / won't / can't pay up. The defaulters have been issued several reminder letters, but they have chosen to blatantly ignore all these reminders. You can be sure they will similarly chuck the eviction notice in the trash bin. The EPF is flushed with money and currently holds RM470 billion in assets. The crux of the problem is the half-hearted attempts by enforcement officers to impose penalties, coupled with the habit of bending over backwards to accommodate defaulters. PJCC is prepared to discuss payment arrangements including accepting instalments. PJCC wants to wield the stick, but at the same time doesn't want to be seen as the bad guys. The result? PJCC is perceived as a toothless tiger that no law-breakers would take seriously. The same goes for most government agencies. They make poor bill collectors. And so the losses keep mounting. Billions of the rakyat's money washed down the drain. No chance of recovering it. The same thing with student loans. Unfortunately these financially painful lessons are not learned. And the long history of mistakes repeats itself. 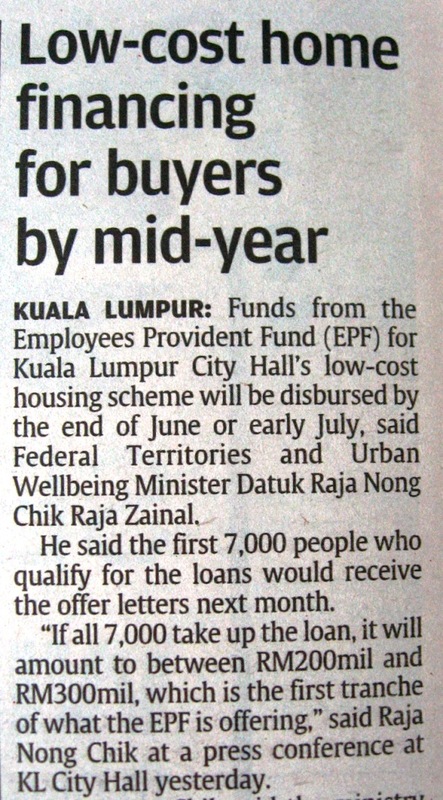 A case in point - Kuala Lumpur City Hall (DBKL) recently announced that RM1.5 billion of EPF funds will be used to finance DBKL's low-cost housing scheme. 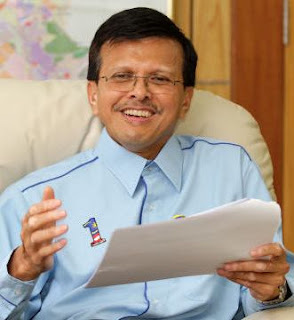 Federal Territories Minister Datuk Raja Nong Chik said the ministry had already offered the loan to 24,000 City Hall low-cost housing tenants. The funds will be disbursed by June or July this year. For sure, no commercial banks is prepared to finance these high-risk loans. The solution? Turn to the EPF. It's the government's second piggy bank after Petronas. But EPF funds belong to people like you and me who have worked hard to put aside some savings for their retirement years. Should we be concerned that City Hall is digging into our retirement pie without so much as a "May we?" to ask for our permission? Have we no say in where our money goes? Based on the poor track record of low-cost housing defaulters, we can probably say Bye-Bye to the bulk of the RM1.5 billion. What happens if these "eligible" applicants later find themselves unable to keep up with the repayments? Or worse, refuse to honour their part of the contract even though they can afford to? How safe are my EPF savings? Of course, DBKL will assure employees and retirees that there is no cause for alarm. 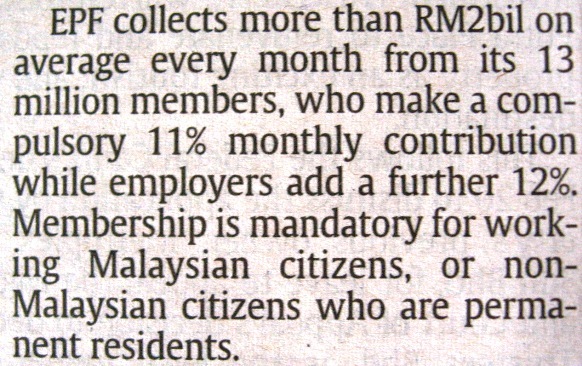 What would be your course of action if you had savings with the EPF? Lily, in a nutshell, the UMNO/BN don't give a damn what Malaysians think anymore. A long, long time ago!!! They'll do everything under sun and even beyond that to inveigle into the good books of the electorate. And any trick will do. Once they get another term, they can continue their paradise and we can continue our hell!!! We should go all out to deny them their rose garden. High time to give them hell!! !